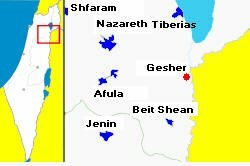 Battle of Kibbutz Gesher (Hebrew: גשר) - Gesher is a Kibbutz of the United Kibbutz movement. Gesher means "bridge" in Hebrew, and the Kibbutz got its name from the Naharayim bridge. It was founded in 1939 near the Naharaim bridge in Northern Israel, In Israel War of Independence it was attacked by the Iraqi army and the Jordan Legion in the very first days of the Arab invasion. After the war, the site of the Kibbutz was moved somewhat northwest of the location shown on the map, which is today a museum. The original Arab plan had called for the Iraqis and the Jordan Legion to attack jointly and capture Afula. On May 13, 1948 however, King Abdullah of Jordan informed the Iraqis that the Legion would remain in the West Bank. The Iraqis nonetheless attacked Gesher. On May 14, the Iraqi expeditionary force occupied the Routtenberg electric plant at Naharayim, an Israeli enclave east of the Jordan river. The Jordanians looted the plant the next day. The Iraqi force consisted of the Second Brigade group, with two infantry battalions, an armored car battalion and an infantry battalion of British 25 pound canon. Their aim was to follow the I.P.C. Tap Line to Haifa, in an attempt to secure the oil pipeline to Haifa. 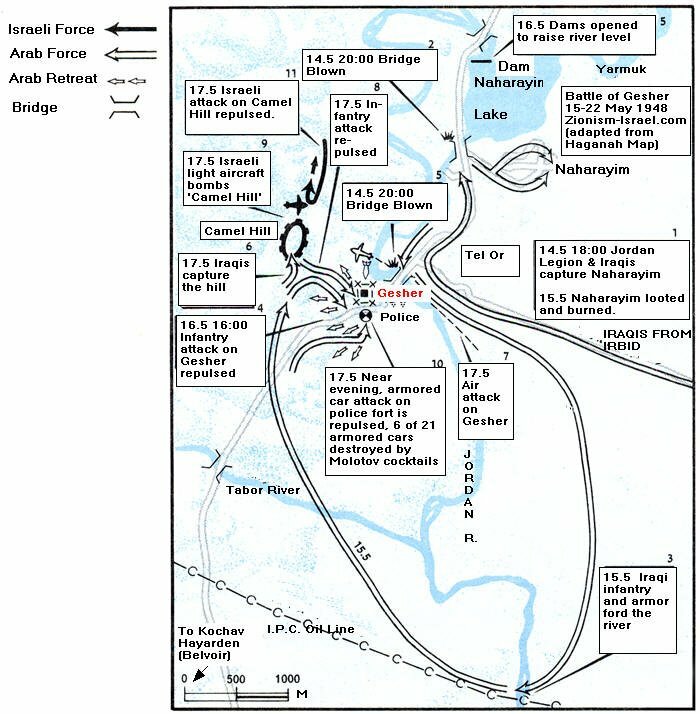 The Iraqis tried to cross the Jordan at the bridges. However, all nearby bridges in the area had been destroyed by sappers of the Golani Barak brigade on 14.5. They forded the river instead at a lower point, having erected a temporary bridge, but apparently could not bring over tanks. They besieged Gesher from May 15, and attacked it by air. On May 16 or 17, they took nearby Camel hill. This was followed by an air attack on Gesher and armored car assault on the police fort on the evening of May 17. Six armored cars were put out of action by Molotov cocktails and the rest fled. On 21-22 May, the Iraqis advanced on Belvoir, Kaukab al Hawa (Kochav Hayarden), South West of the area in the map, but they were beaten off by Golani brigade troops who by now had 2 65 mm "Napoleonchik" French artillery pieces. Abd al Ilah, the Iraqi regent, witnessed the defeat. The Iraqis concluded that they could not advance, and the Jordanians wanted them in the West Bank. The Iraqis retreated south to Jenin and stayed in the Samaria (Northern West Bank) area for the rest of the war. A museum on the old site of kibbutz Gesher commemorates the battle. Herzog, Chaim and Gazit Shomo, The Arab Israeli Wars, Vintage Books, N.Y. 2005. Morris, Benny, 1948: A History of the First Arab-Israeli War, Yale University Press, New Haven, 2008. Do not copy this or any other article to your Web site or use it for any purpose without the written permission of the author.